What’s with the class-conscious Brits and their enduring fables of impoverished blokes suddenly discovering that they are noble-born? That was the plot of 1937’s Me and My Girl as well as a more recent confection from three years ago, A Gentleman’s Guide to Love and Murder. In the latter, commoner Monty Navarro not only learns of his exalted lineage, but also that he is eighth in line to become the Earl of Highhurst. So naturally he sets about to knock off the seven newly acquired relatives standing in his way of becoming rich and powerful. And homicide has rarely been this much fun. The show is set in London and its environs, but its creative team is strictly American. 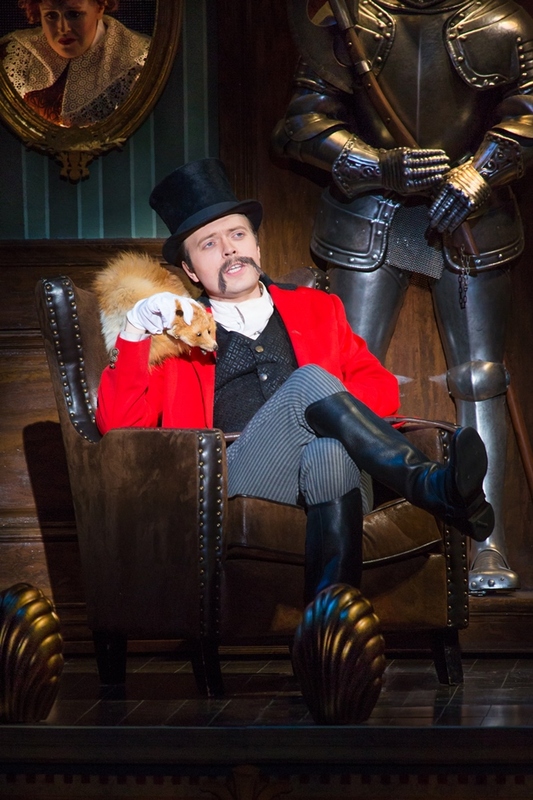 First hatched at Hartford Stage, Gentleman’s Guide was staged by that company’s artistic director, Darko Tresnjak. He shepherded two Broadway rookies – book writer and co-lyricist Robert L. Freedman and composer and co-lyricist Steven Lutvak. Here’s hoping we see a lot more from them in the future. The story is based on a 1907 novel by Roy Horniman called Israel Rank, which was rescued from obscurity in 1949 by its adaptation into a droll film comedy, Kind Hearts and Coronets. The musical does not credit the movie because of some rights snafu, but it does co-opt its key stroke of genius – having a single performer play all eight of the soon-to-be murder victims. In the film, it was the great Alec Guinness, on Broadway it was the nimble Jefferson Mays and in the national tour now playing at Fort Lauderdale’s Broward Center, it is the somewhat broader but still remarkable James Taylor Odom. With a host of silly walks, stances and voices, Odom plays such comic types as Rev. Lord Ezekial D’Ysquith, a dotty old cleric destined to meet his maker after a Hitchcockian fall off a church tower. Then there’s Henry D’Ysquith, an amateur beekeeper who encounters a swarm of lethal trouble, and Lady Salome D’Ysquith Pomphrey, an actress cast as Hedda Gabler whose stage prop pistol is curiously loaded with live ammunition. And most drolly, do-gooder adventuress Lady Hyacinth D’Ysquith runs into politically incorrect ethnic peril in Egypt, India and darkest Africa. And on and on. And for those of you with little interest in murder, there is the love side of the guide. Monty is in a romantic relationship with money and class-conscious Sibella Hallward (Colleen McLaughlin), but she is losing interest in him when she learns he is low on funds. Entering the picture to complicate matters for Monty is his new cousin, Phoebe D’Ysquith (Erin McIntyre). He tries to keep the two women far away from each other, as seen in the farcical, door-slamming number, “I’ve Decided to Marry You,” cleverly staged by Tresnjak and adroitly performed by Blake Price with rubber-limbed skill. There are other standout numbers, but by and large the show’s weakness is the Freedman-Lutvak score, which too often settles for faux-Gilbert and Sullivan patter songs. On the other hand, Aaron Rhyne’s projections are devilishly witty, as is Alexander Dodge’s stage-within-a-stage old time proscenium set. And Linda Cho absolutely deserved her Tony Award for her tony period costumes. You do have to lean in and listen closely to catch all the lyrics, which often speed by too rapidly to be fully appreciated. 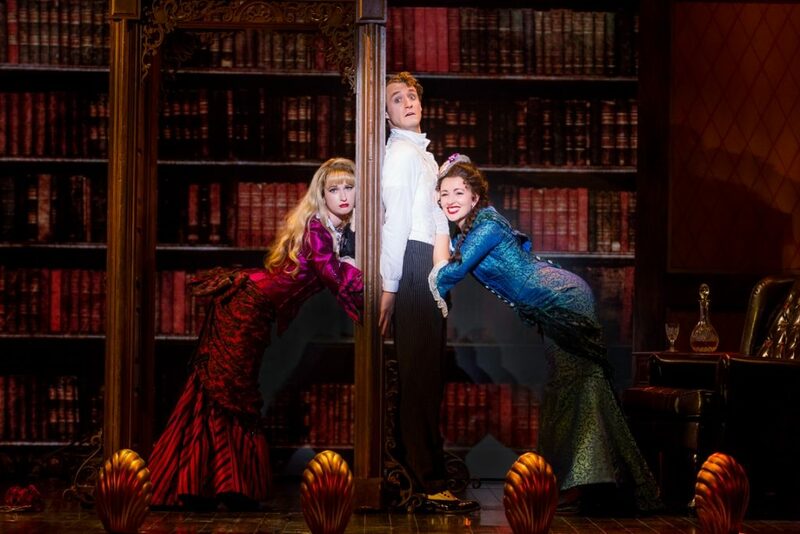 A Gentleman’s Guide deserves its critical acclaim and its two-year Broadway run, but it takes precision performers to pull it all off and fortunately that is exactly what it has in this road company production. A GENTLEMAN’S GUIDE TO LOVE AND MURDER, Broward Center, 201 S.W. Fifth Ave., Fort Lauderdale. Through Sunday, Jan. 21. $30-$160. 954-462-0222 or browardcenter.org.